The holidays are over and it's back to work - fueled by the excitement of New Years Resolutions still yet to be broken. One of my resolutions is to be more creative. While moving to my new location I took the opportunity to purge some things that I no longer use. During this process I couldn't help but notice all the items I picked up over the years with full intention of crafting just for fun. I know I kicked them around the office for awhile before tossing them in a box to get them out of the way. Then I totally forgot about them. So today I started out by shoveling snow (exercise!) 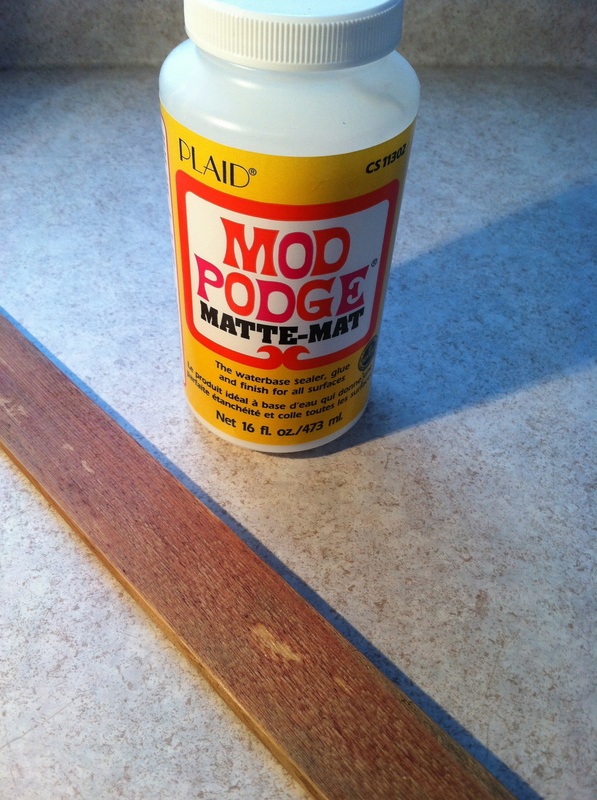 and firing up my new Keurig (Gloria Jean Hazelnut) and decided to see what this Mod Podge was all about. Using this pinterest link I decided to do a wood transfer. Not willing to commit to a large piece of wood I selected a piece of wood shim. If it looks cool maybe I'll do a bigger and better one. Here's the photo I'm using. Several of my favorite photos of Adam and I. A basic copy or print is all you need. I painted a layer of Mod Podge and placed the print face down on the wood. Now I have to wait 24 hours to wash it off and see if it worked. Fingers crossed. I was pretty careful to dampen and rub the paper off of the wood and it was not looking promising. When it dried it was hazy and bits of paper still stuck to it. So I thought - what do I have to lose? A piece of paper and a junk piece of wood? So I ran it under the faucet and washed the stick. Suddenly my images appeared nice and strong. But I think I rubbed the semi wet paper too hard and in different parts my image was rubbed away. You can see how this looks "kinda cool". Not exactly as good as I expected but considering I wimped out by using a cheap piece of material it was a fun trail run. I liked learning which photos work best. 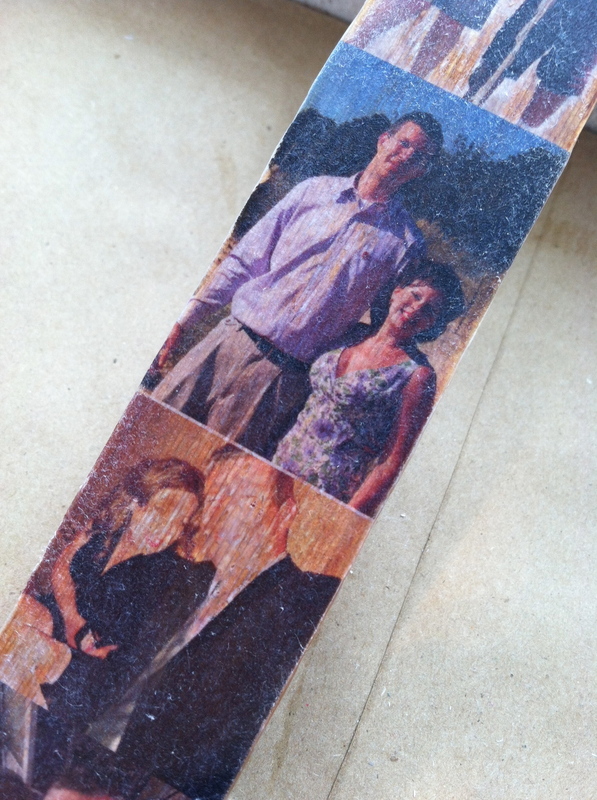 For instance I like how the top photo (which had a light background) just sort of faded into the wood. Photos with a busy background didn't look as good. The stick now lives on my little memo board behind my desk. Next time I'll "go big or go home" and choose a great photo and a great piece of wood. This is an easy project with lots of potential. And pretty cheap if you have a pile of junk wood at your disposal. It was free for me since I had a long forgotten bottle of Mod Podge, a box of shims and a foam paint brush already in my stash. Brides looking for that rustic look might consider doing something like this to create custom table numbers, or a cool bar menu. After all, anything you can print on a laser printer will transfer using this method.